﻿ Amble Inns, Pubs and Drinking Establishments of the 19th Century. This will be the old Salt Pans at the bottom of the Wynd. Amble Inns, Public Houses and Drinking Establishments of the 19th Century. Date built/operating Notes / Description. ?-1811-? Cottage at the top of the Wynd. McAndrews records this as Amble's very first drinking establishment. The cottage owner held a victualler's licence in 1811 when it changed hands, so its history as a 'retail beer house' N pre-dates this. McAndrews also notes this cottage as having a secret cellar, which became known when it sold in 1811 to the Richardson family, suggesting a strong likelihood of it being a hiding place for smuggled goods. 1820s?-1870s? Closure of the above saw the Queen's Head established as a the only village inn, just around the corner from the Wynd cottage in High Street. John Shanks was the innkeeper according to McAndrews and the inn was still marked on the 1860 Ordnance survey, he also notes that the Queen's Head is 'now the property occupied by Mr J.T. Melrose, Butcher', which on the 1891 census is given as 25 High Street. 1820s-1910s? Built in High Street opposite the Queen's Head by James Innes. McAndrews (1910) records this as "the oldest public house in the town" The 1891 Census gives the address of the Gardeners' Arms as 28 High Street, and in the care of Francis Holliday (widow) aged 36, licensed victualler. 1837- present The south west quarter of Queen Street was build by the harbour contractors as part of the planned development of the town in 1837. This block contained the Waterloo Hotel. Named 'The Waterloo' in honour of Troop Sergeant Major William Perrie, father of the first publican (also called William Perrie) who served in the 2nd Dragoons at the Battle of Waterloo. 1840s?- present Built according to McAndrews during the construction of the "Berwick-Newcastle Railway", ie the late 1840s, The Amble branch mineral line was also laid down in this period. Part of 'Walker's Buildings' in the census returns, located to the north side of Queen Street near the High Street junction. These buildings and 'Walker's Yard' connected with 'North View' which now terminates near the Dock Hotel. Footprint of the Radcliffe Arms (from comparison of the Ordnance Survey maps) probably lies within what is now the car park of the Co-op supermarket, or very close to it. mid 19th century - present Built at the corner of what was then Blue Bell Row and Broomhill Road, now Albert Street and Woodbine Street. mid 19th century - present Built in what was previously Blue Bell Row, now Albert Street. In his book "Warkworth Harbour" Eric Simonsen notes that the original building was gutted by fire in August 1901, being rebuilt by R&G Brown, which explains why this is red brick rather than sandstone. mid 19th century Built on the Wynd opposite the gas works. 1860 Map location coincides with the white painted private residence shown, which we assume is the original building. pre-1860- present Built in the area known in the mid 19th century simply as 'Amble Harbour', now Leazes Street. mid 19th century -2009 High Street and Albert Street. Previously Togston Square. Previously a farmhouse. Built at what was then the end of the south side Queen Street (now Queen Street / Cross Street corner). Became McInnes stationary shop in the latter part of the 19th century. 1848 - Built next to the Blue Bell Inn in Albert Street. This is now the South end of the Cliffwell Service Station. No trace of the Railway Hotel remains. "To be let by Proposal, and entered on the 11th Day of October next, All the convenient and newly built HOTEL situate at Amble, in the county of Northumberland, called "The Railway Hotel" containing large room, with sliding partition, Two Bed Rooms, Bar, Parlour, Tap Room, Kitchen and Cellar; together with Yard, Stable, and other Conveniences. The House is situate on the Thoroughfare leading from the Town Street of Amble to Radcliffe Colliery, Hauxley, Togston, Broomhill Colliery, and Widdrington, and with a short distance of the branch Line of Railway running from the trunk of York, Newcastle and Berwick Railway to the rapidly increasing and flourishing town of Amble. The above hotel will be let with or without a brewery, which may be built to suit the wishes of the tenant, and to meet demands of the place. For further particulars, apply at the offices of Mr. Wm. Forster Solicitor, Alnwick, where the proposals will be received until the 30th inst. ALSO TO BE SOLD BY PRIVATE CONTRACT, a quantity of ground, as building sites, adjoining the above Hotel. For particulars, apply at the above offices, where a plan of the sites and elevations may be seen. Alnwick, Sept. 15, 1848"
mid 19th century >1911 21 Leazes Street. Managed by John Burton in 1901 who was also a "Mineral Water Manufacturer". 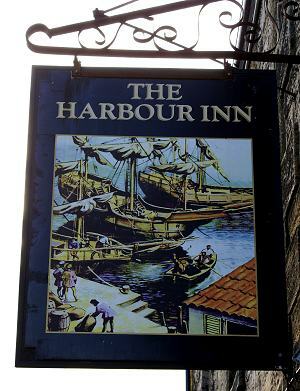 Building is now part of the Harbour Inn. Thomas Carse Carrier and Innkeeper, age 59, wife Ann. Thomas Carse Carter and Innkeeper, Togston Square, age 69, wife Ann. Hugh Marshall Shoemaker and Innkeeper, Blue Bell Row, aged 29, wife Ann. John Potts Reed Innkeeper, Salt Pans N, aged 53, wife Mary. Thomas E. Shade Innkeeper, Newburgh Terrace?, age 41, wife Isabella M.
Mary Purdy Innkeeper, ? ?, age 37, married. Catherine Hedley Innkeeper, ? ?, age 41, married.